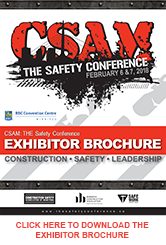 CSAM: THE Safety Conference is recognized as Canada's premier construction safety conference for a reason: offering quality training courses and interactive workshops, customized work materials, breakfast and catered lunch, networking opportunities, a one-of-a-kind trade show area, contests and more! This year, CSAM: THE Safety Conference will take place on February 5 & 6, 2019 at the RBC Convention Centre Winnipeg. Please leave yourself ample time to park, register and find your workshop.